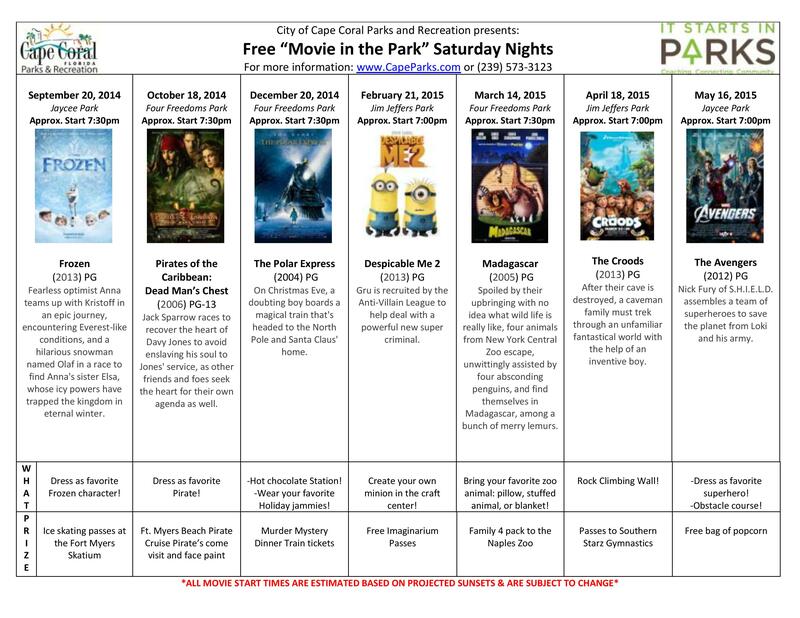 FORT MYERS, Fla. (December 8, 2014) – Pediatric Dentistry of Ft. Myers, Dr. Tim Verwest, DMD will sponsor the free “movie in the park” in conjunction with the City of Cape Coral Parks and Recreation for the 2015 season. The City of Cape Coral Parks and Recreation will have special activities and a grand prize giveaway for each movie. “Many of our patients and staff live in Cape Coral, we’re happy to be able to help sponsor family activities and we’ll continue to show we care about our community because we sincerely do,” said Dr. Tim Verwest, DMD of Pediatric Dentistry of Ft. Myers. Among the movies that Pediatric Dentistry of Ft. Myers is sponsoring include, Despicable Me 2 Saturday, February 21 2015, The Croods Saturday, April 18, 2015, and The Avengers Saturday, May 16, 2015. 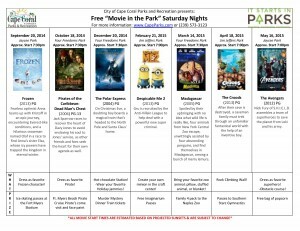 For locations and movie times, please visit www.capeparks.com or call (239) 573-3123.